The Immersive Theater cladding was designed to appear as a natural, organic component encased in a clean modern box, as if it were on exhibit by the museum. 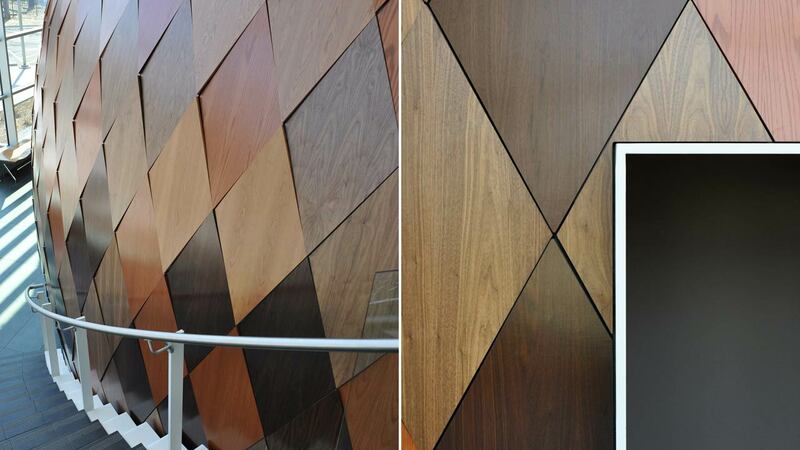 A pixelated gradient is created on the surface by using six species of wood veneer. The transition from dark to light is intended to graphically mimic natural aging characteristics of materials exposed to the elements. 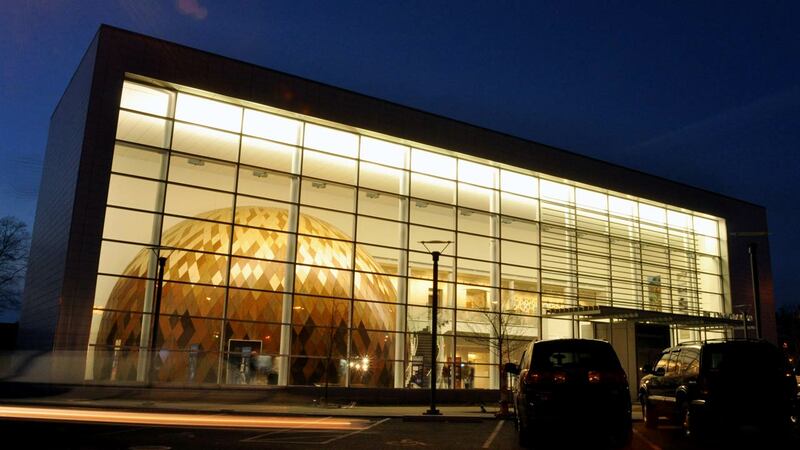 This project was commissioned by the Evansville Museum of Arts History and Science as part of an expansion project that included a new entrance pavilion. Conceptually the cladding for the Immersive Theater is representative of the natural aging characteristics of materials that are exposed to the elements. In this way, the object seems as if it had always been in this place: an artifact that has been preserved by the surrounding building. 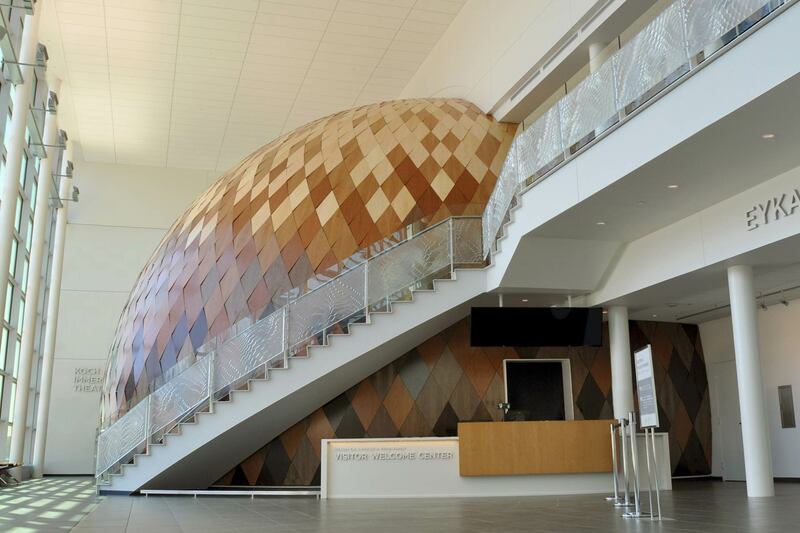 The existing 30’ radius dome was three-dimensionally scanned and digitized in order to geometrically subdivide into panels. 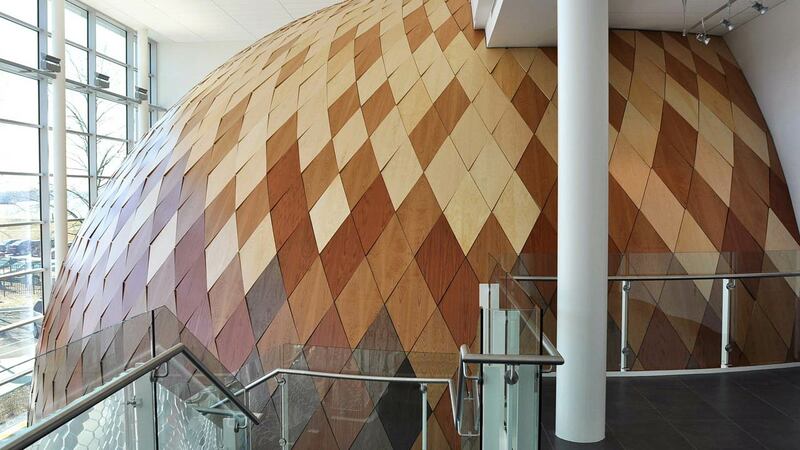 The textures created from the flat panels on the curved surface of the dome give the perception that they are curling outward, as if affected by humidity. This effect was achieved by subdividing the surface into planar diamonds, rather than a triangulated mesh. Based on the dome’s construction, overall form and surface imperfections had to be accounted for to allow our system to float accurately. Utilizing the original surface from the scan, we were able to calculate the distance from each of the panels’ corners. This was necessary to create custom spacers to adhere each panel back to the dome. Each of the 1500+ panels was uniquely cut, associated with a specific size, species, and placement. 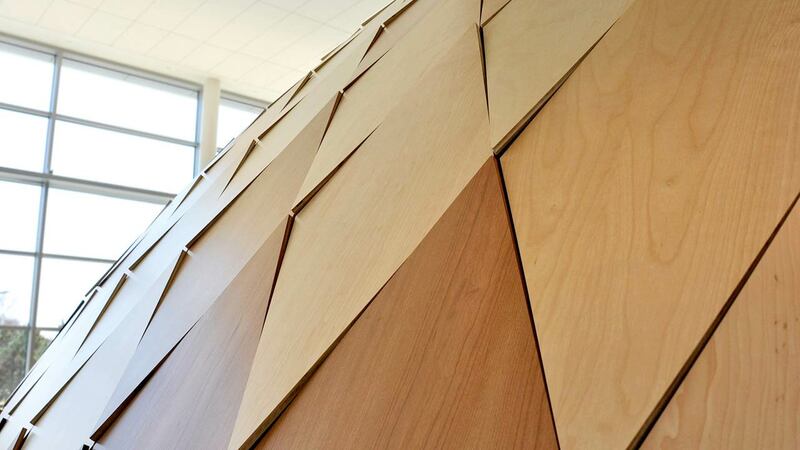 This simplified installation, having a completely prescribed system with only one location on the dome for each panel, including custom door, floor, and wall conditions. Only 10 parts required slight modification on site due to the accuracy of the scan and installation techniques.